Injured Australia bowler Mitchell Starc hopes his replacement Jackson Bird "sticks it up" England in the fourth Test, which starts on 26 December. Starc, the leading wicket-taker in the series with 19, misses Melbourne's Boxing Day Test with a bruised heel. Last week England's James Anderson said Ashes winners Australia have "problems" beyond their first-choice attack. Starc hit back: "I think they have got bigger things to worry about than the depth of Australia's fast bowlers." 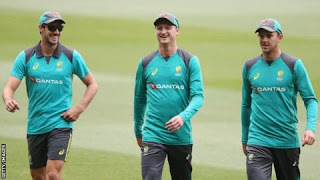 Australia have been helped to their unassailable 3-0 lead in the series by the pace of Starc, Pat Cummins and Josh Hazlewood - bowlers who have been bowling in excess of 90mph.